If you are planning an international trip, you may be considering what type of Internet connection and network service you need. Your choices are to use the services of your network provider (e.g., Verizon, AT&T, Rogers, Telus etc. ), the services in the country you are visiting, or rent (or purchase) a personal Wi-Fi Hotspot. You most likely have an existing plan with a network provider so you may find it easier to stay with them while traveling. Services like T-Mobile offer international plans that include unlimited text and data while overseas. However, the 2G speeds and further throttling down to even slower speeds can be very frustrating, especially if you need access to GPS, social media and internet streaming. And not all plans are equal. Some providers charge exorbitant rates to add on international services, or you may experience outrageous data roaming charges. You can usually find an Internet café no matter where you travel. Hotels, airports, trains, and cruise ships also offer Wi-Fi services. However, the drawback to these is that the connection may be unsecured, slow, or restricted to usage limits. And some may add on a usage fee. The greatest benefit of using a personal Wi-Fi hotspot is security – you have a unique password on a secure network. And, Wi-Fi hotspots work in almost any destination worldwide. With a pocket Wi-Fi hotspot, you aren’t limited to where you can use it, as you are with a hotel or Internet café. It works anywhere you are – whether on a train, in a taxi, or just out and about. A hotpot is convenient to travel with as it lightweight and doesn’t take up much space. You can stash in your daypack, purse, or pocket. One hotspot will connect up to 5 devices (e.g., smartphone, iPad, laptop, Kindle, etc. ), so you can easily share it with others in your traveling party. You can rent or buy a Wi-Fi Hotspot from Wireless Traveler and use it in over 170 countries. Each hotspot comes with a charger and travel adapter. Our unlimited data plan with standard network speeds is perfect for basic services like checking emails, messaging, or browsing websites. If you are looking for higher speeds that allow for the basic services plus streaming applications and Wi-Fi calling, you may want to consider our Global Service program. You rent or buy a hotspot and then add the data bundle that best fits your needs. Rates start as low as $15 for 100MB and $89 for 1GB in Europe. 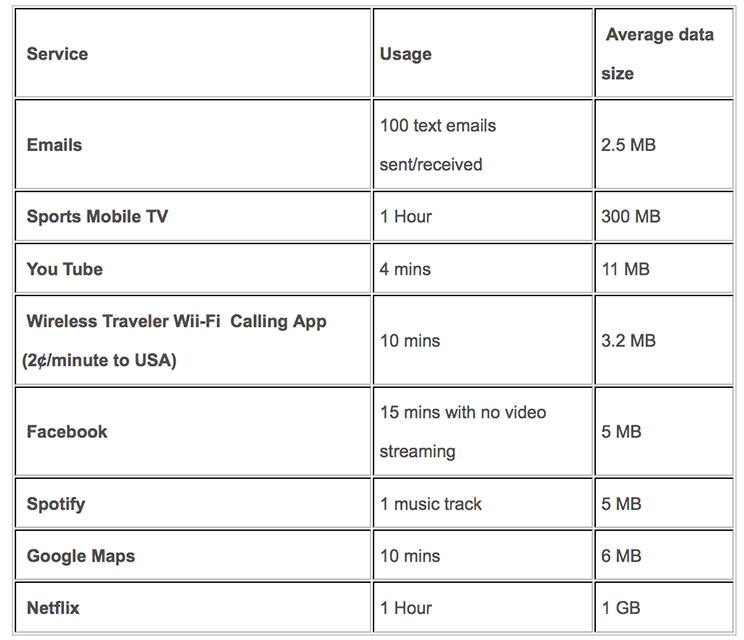 Check out this handy chart if you’re not sure how much data you use. If you’d like to rent or purchase a Wi-Fi hotspot, you can order one directly from our website.